The mere mention of the Brechner Center for Freedom of Information makes me smile, reflexively, broadly. It was, for me, the beginning of an educational journey, certainly, but more importantly, the origin of friendships that have stood the test of time, distance, schedules and life changes. While many twists and turns have shaped my career, those heady days in the Center surrounded by such intellectual fervor as I had never seen catapulted me forward, allowing me to imagine a future for myself beyond anything I had envisioned beforehand. It’s admittedly trite to say that a place made you who you are, but that’s the only way I know to say it: I owe it all to the Brechner Center. A few years in the reporting ranks left me wanting more. Almost by happenstance, I found my way to the University of Georgia’s Grady College, where a graduate class in media law became a turning point. Fascinated by government secrecy, I wrote my thesis on Georgia’s sunshine laws and wanted to know more, so much more, about this new-to-me world. A wise mentor, Kent Middleton, shepherded me through the doctoral application process. During one of our conversations about where to go, he said that if freedom of information interested me, there was but one place to go, and one man to work with: Bill Chamberlin at the University of Florida. For an Athens, Georgia-raised Bulldog, this was a tough pill to swallow. I had never crossed the Alachua County line, and to this day, I have relatives and friends who raise an eyebrow at the prospect of such a cultural inversion. Those who know me know I never wavered in my loyalties (the color orange has never touched my skin) but this was an educational decision, pure and simple. My father took me down to visit, and we both left convinced that this was a special opportunity, for every person we encountered was welcoming, warm and genuinely interested in my education. The students occupying the Center at that time – Matt Bunker, Paul Gates and Millie Rivera – could not have been more kind and open to collaboration. It was, in the end, one of the easiest decisions I ever made. A few months later, my wife Julie and I had made the leap, and the next three years formed the basis of the rest of my life. Bill pushed me, challenged me, stretched me intellectually to produce work at levels I did not know I was capable of, and did so in a spirit of such familial love that it all felt not at all like work, but like fun. We all loved what we were doing so much, and enjoyed one another’s company so much. Looking back, I’m in awe of the culture that Bill built. He and Jeannie were a constant presence in our lives, and 25 years later, they still are. The Center’s administrative assistant at that time, Amy Walker, remains a dear friend. Sandy Chance joined the team a couple of years after I arrived and has been a mentor and friend for years. Dean Emeritus John Wright served on my dissertation committee and never left my side. Matt, Paul, Millie, Mike Hoefges, Tony Fargo, Susan Ross, Martin Halstuk and many other Brechner alums are among my dearest friends in the world – all brought together by that one small window in time. Charles N. Davis is the Dean of the Henry W. Grady College of Journalism and Mass Communication at the University of Georgia. He was appointed in 2013, after a long career in journalism and education. Davis holds a Ph.D. in mass communication from the University of Florida College of Journalism and Communications. 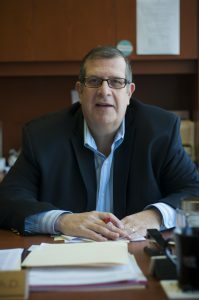 He spent 14 years as a faculty member, including four as department chair, at the University of Missouri School of Journalism, where he served for five years as Executive Director of the National Freedom of Information Coalition.